Welcome to the Happy Days Farm log cabin 2018 Christmas tour. 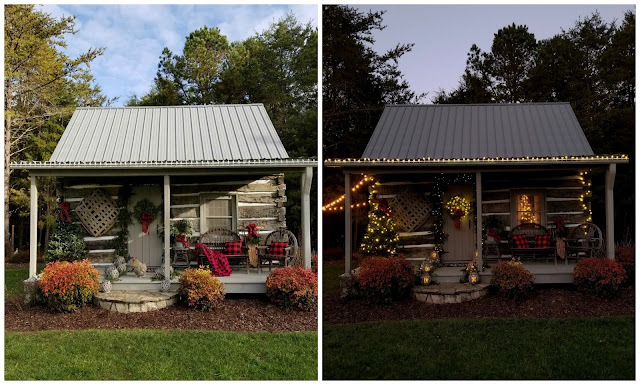 We are participating in a blog hop, so make sure to visit the next blog to see more great She Sheds and Chicken Coops, and make sure to join us on Instagram! 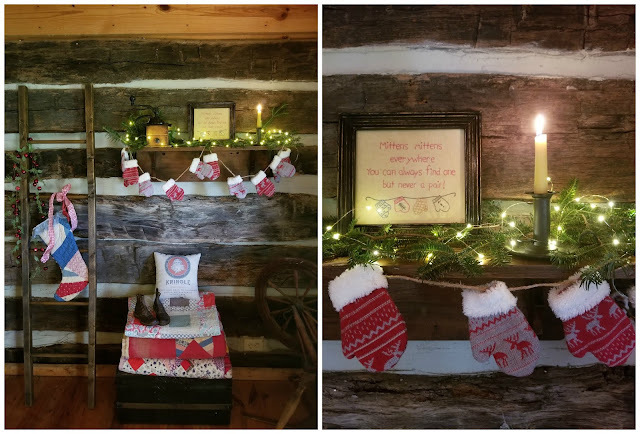 I love decorating my cabin for Christmas! I have been doing it for about thirty years. 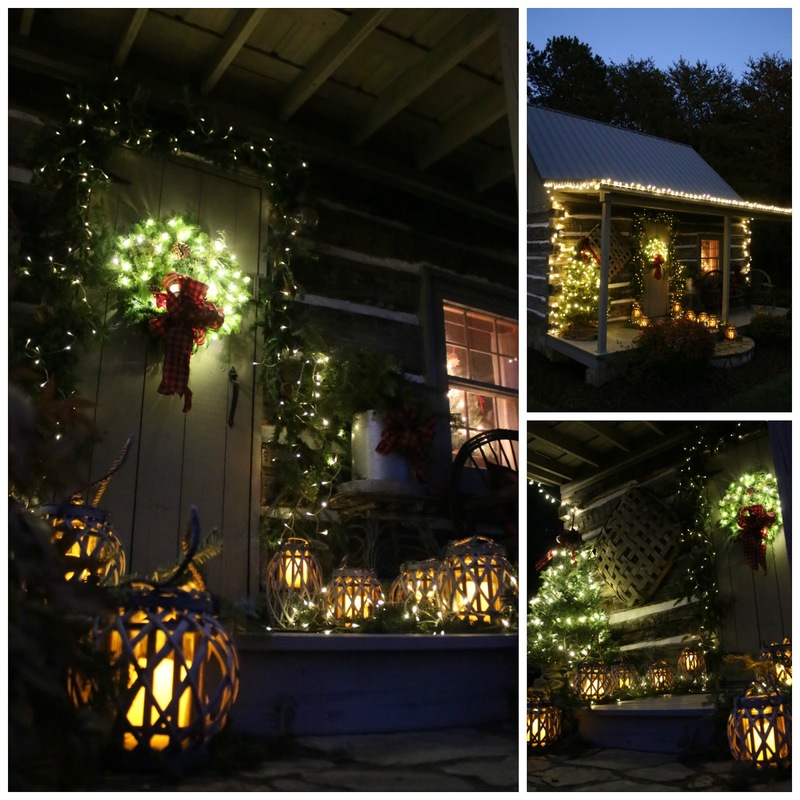 I love placing a Christmas tree on the front porch and fresh greens in the old chicken feeder. 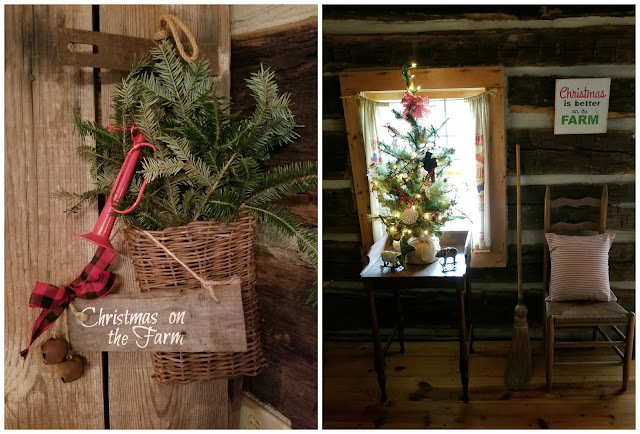 This year, we stopped at the local Christmas tree lot and picked up some discarded branches, and made a garland to go around the door. It’s really easy. All you need is wire and wire cutters. As you can see, I used buffalo plaid pillows, ribbon and throw on the willow settee. My cabin is actually one large room downstairs, and it has a sleep loft upstairs. This is an antique walnut rope bed, that I roped myself. 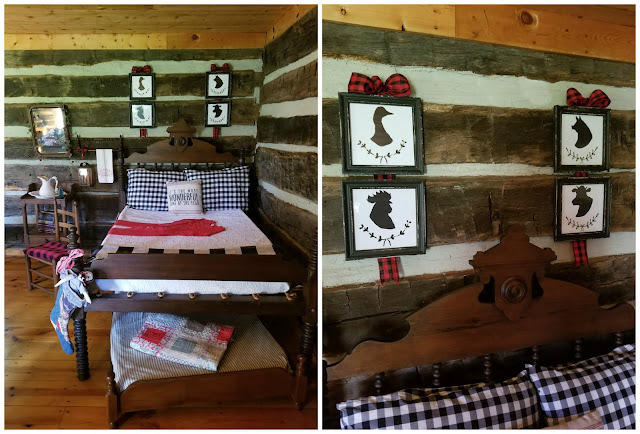 My favorite fun addition this year are these buffalo bows and ribbon behind our farm animal prints. Aren’t they the cutest! We have these adorable black and white prints in our Etsy shop (click here). I think the red and black adds a festive Christmas touch. The quilt on the trundle bed is old, and one that my son actually used for years on his bed. The stocking is made from an old quilt, and it holds an old topsy turvy doll. An old ironstone pitcher and bowl sits on the bedside table. A little faux greenery with bells adds a whimsical touch of Christmas to the old mirror. When I acquired my cabin, it didn’t have any chinking between the logs. I chinked it myself using a product called Perma Chink. The “chinking” expands and contracts with the cold and heat. I love using candles when I can, making it feel cozy and warm. Here you can see the ladder going to the loft. 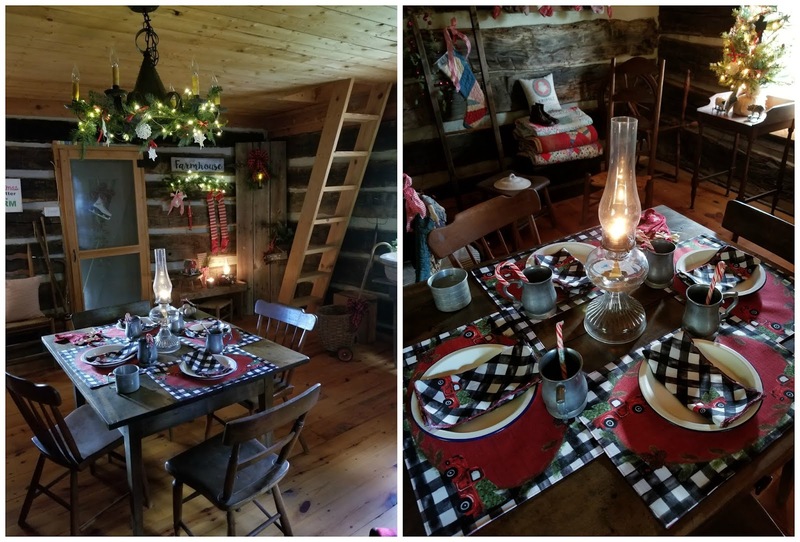 The loft is about 212 square feet, giving a total of 424 square feet in the cabin. The black and red theme continues with these adorable red truck placemats and napkins. A few fresh greens provide a simple and festive touch in this basket. 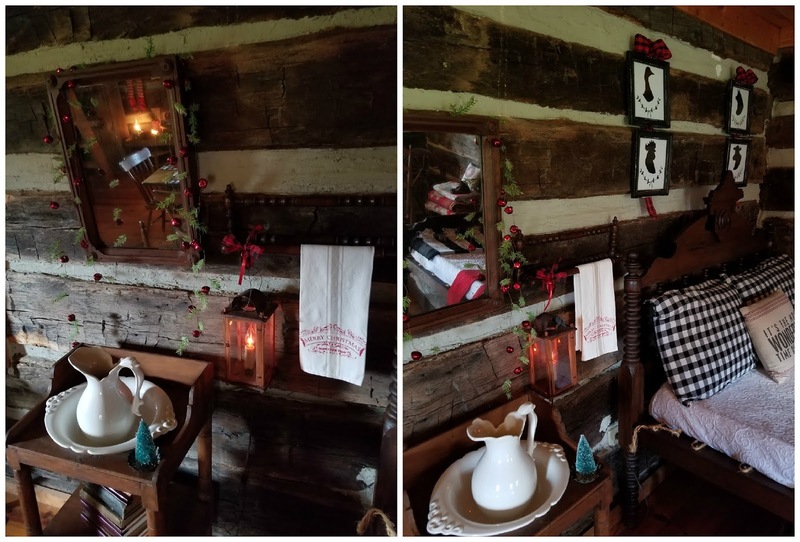 This little tabletop tree in the front window is decorated with gingham bows, hand crocheted snowflakes, and tin santas. Thank you for stopping by! We hope you have a wonderful and Blessed Christmas! 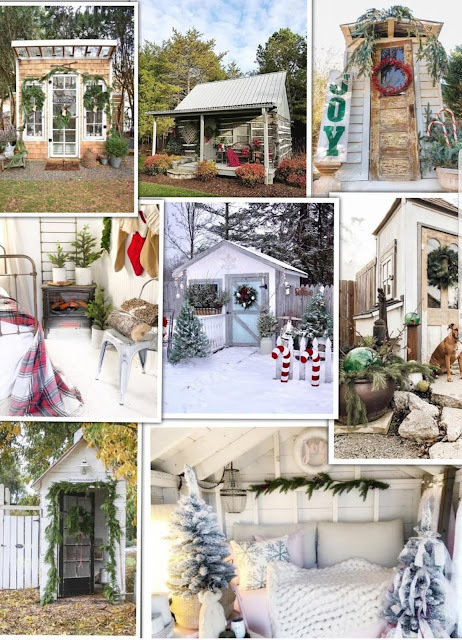 Also, Please check out these other bloggers for more Christmas She-Shed and coop inspiration.